Male elk, called bulls, carry an impressive set of antlers that sweep backwards toward the rump. These antlers are usually chocolate brown, except for the tips, which are polished ivory-white. An adult bull’s antlers will usually weigh about 12 pounds per side and extend about 50 inches in length. A yearling bull elk usually carries a single, spike-like antler on each side of his head; hence the term for these yearlings is “spike bull”. A two-year old bull usually carries thin, spindly antlers with four or five points on each branch. These antlers ten dot be scrawny and raggedy looking, hence the term for an immature bull, “raghorn”. 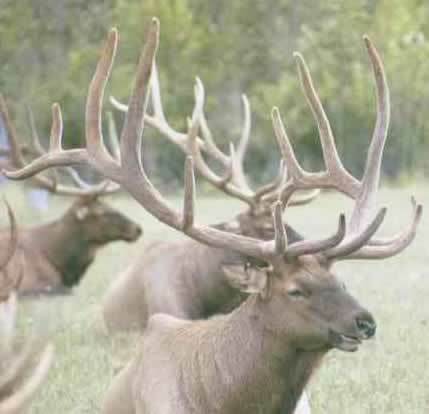 A mature bull usually carries antlers with six points on each side, though some older bulls will carry seven, and occasionally eight points on each antler. A six-point bull is called a Royal. A seven point bull – an Imperial; an eight point or better bull – a Monarch. An elk sheds his antlers each spring (antlers shed annually, horns are permanent) and immediately begins to grow new ones. Once the old antlers fall off, a bloody pulpy wound surrounded by bone called the pedicle, becomes visible. Within days, a velvet covering protects the pedicle and this covering can be seen raising with each passing day as the new antler growth begins. A very complex process of nutrition takes place in the bull’s body to accommodate antler growth at this time. 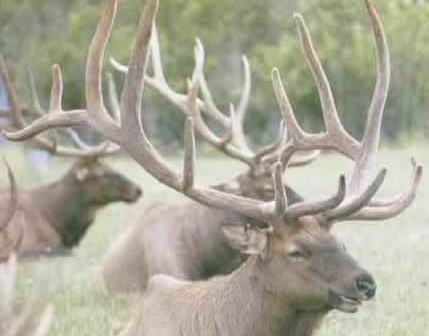 The entire antler growing process is triggered by a small amount of testosterone, produced by the testicles, which reaches the tissue inside the pedicle and induces growth. Various other chemical compounds, far too complex for the average person to understand, also contribute to the intricate growing process. The antlers at this very early stage are covered with a soft velvet membrane. Both antlers and the pedicle grow at this time a result of cartilage tissue being deposited by a network of blood vessels. In this velvet growing stage, an elk’s antlers are pliable and warm to the touch. As the bull’s antlers reach maximum growth, an increase in testosterone levels actually cuts off the blood flow to the antlers, and they die, leaving behind dead bone. The bull then rubs the dried velvet coverings off the hard antlers, which at this stage are a dull white. The antlers are colored by the reaction of oxygen with juices from plants and trees rubbed during the velvet removal process. However, the bull elk begins to prepare for the upcoming mating season as soon as the velvet is rubbed from his antlers, so he will continue to vigorously rake trees with his antlers in mock battle. A bull going into mating season often becomes very aggressive and will often destroy a young tree with his antlers. It is not unusual for a bull to break a point or two from his antlers during these mock battles with trees, or during real fights later during the mating season.